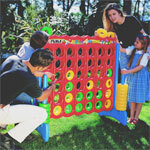 Homepage | Special Events | Giant Garden Games to Hire for Parties! Drop in your checkers and be the first to get 4-in-a-row to win. 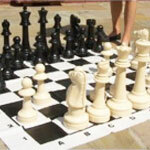 The classic strategy and intelligence game for children and adults alike. Ideal for organising championships either at home or at school. Easy to store. Contains 56 bricks (18cm x 4cm x 6cm). Builds from approx 75cm (2'6") to as high as you dare! 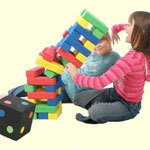 Build the tower then take turns to remove a brick at a time without making the whole tower tumble. Ideal for garden parties! A giant version of the classic Ludo board game. 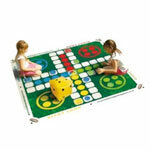 The playing mat is 3m x 3m and comes with foam playing counters and two large inflatable dice. Great for children's parties or with friends at the BBQ. Balloon Box Bromsgrove have a great collection of giant sized garden games including this children's favourite! 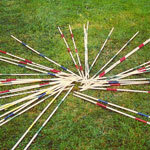 90cm Pick-up sticks. Only the steadiest hand can succeed. 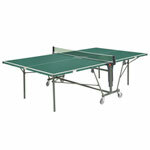 Table tennis, a game for 2-4 players. Fun to have at parties both indoors and out. Comes with 4 bats and 6 balls. Can be delivered in the Bromsgrove area. Call Balloon Box for more information. 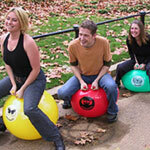 Adult and child sized Space Hoppers, complete with competitive names such as Daredevil, Psycho & Hotshot. Foot pump and whistle are included. 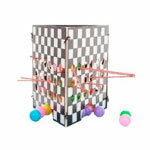 Call Balloon Box Bromsgrove for more information on our new range of Garden Games. A massive coloured tower with a giant dice. A game of skill and tactics ,throw the giant dice and it gives you a choice of 2 colours, remove a brick of that colour from the tower. Get it right and the tower stays tall - get it wrong and the tower will fall! Great party game for up to 30 players! throw the 2 dice to decide what part of the body has to be placed on which colour flower on the mat, but fall over and you lose. 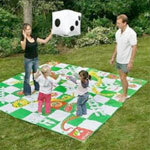 Set contains 3m x 3m mat, securing pegs and two giant inflatable dice.